Sometimes getting started and maintaining capacity management can be a hard sell into an organization, especially where the common misconception is that just increasing the available capacity is cheap. · In the initial audit or implementation phase there will be objectives set by the business about what they want to see from the capacity process. Ensure these are understood and at least some of the KPIs are built around those objectives. · Carefully monitor incidents and problems, ensure all capacity related tickets are captured and ultimately reduced over time. 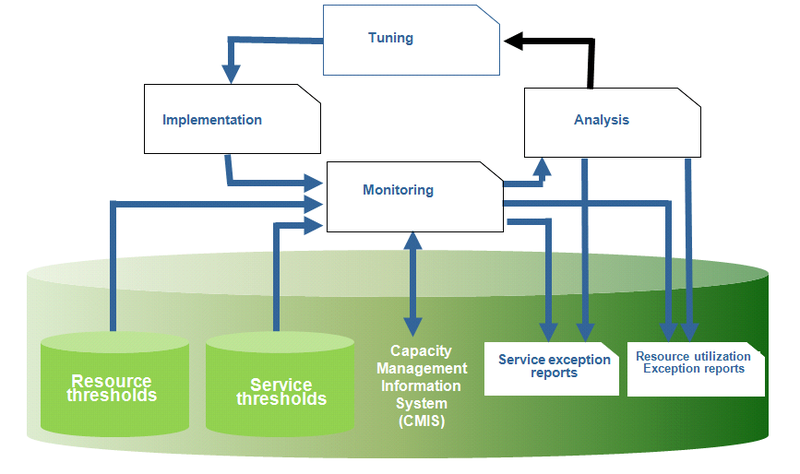 Continual Service Improvement (CSI) is a “reasonably new” concept within ITIL, but capacity management has had an iterative cycle of “Monitor – Analyse – Tune – Change” since at least version 2. This cycle of improvement is critical in optimizing the IT environment and is one of the key parts of the process for creating value.